Planning a visit to Washington but need a little help planning the best route and things to do? 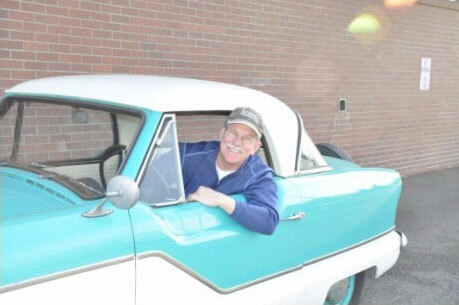 Never fear, our staff of local experts (like Marcus pictured here in his 1962 Nash Metropolitan) have traveled nearly every back road in the state can either help you from personal experience of point you in the direction of someone who can. We will be travelling to the US next summer and we would really like to visit Washington state for a week or so. We are a family of four - mum and dad (50 years of age) and two young adult children (18 and 21). Can you please recommend some destinations in Washington where we can stay for a week and enjoy some easy to medium difficulty hiking, river rafting, guided nature walks, star gazing etc.We spent a week two years ago in the Yosemite national park and really enjoyed it and we would like to enjoy a similar experience in Washington. Thank you in advance and we send our best wishes to you from Frankfurt in Germany. Thanks for reaching out. Based on your list of activities, I would like to recommend a week on the Columbia River Gorge. Depending on your lodging budget, I think setting up a home base at Skamania Lodge or the historic Inn at the White Salmon would be perfect for you. From there, there are several easy to medium hikes to waterfalls and on the ridges overlooking the Columbia River. For a slightly more strenuous hike, I loved hiking to the top of Beacon Rock. Mentioned in the Lewis and Clark journals, the hike up this historically significant landmark is about a mile to the top on a series of boardwalk switchbacks and rewards you with a spectacular view. I am 68 years old and did not find it too challenging if you take it slow; it is not really steep. There are a couple of great rafting companies up near BZ Corner and a really friendly horseback trail riding company that you may want to consider. CLICK HERE for a list of outdoor adventures. In Stevenson, be sure to visit the Columbia River Gorge Interpretive Center for a great overview of the geologic formation of the Gorge and other local community and Tribal history. For star gazing and other must see points of interest, you’ll want to take a day to visit the Mount St. Helens volcano crater from the Windy Ridge Viewpoint. (This is a personal favorite view of the crater and log-strewn Spirit Lake.) The road up to there is filled with great trails and waterfalls so this would be a full day trip. A few miles east of Stevenson, pop into Columbia Hills State Park to see some extremely important Native American petroglyphs on display. Some can be seen in the parking lot but some of the best are only available with a tour from the Park Ranger station. This entire area is “light free” so stargazing is terrific. If you want to zoom into the galaxies, you may want to visit the Goldendale Observatory… a really rare and interesting State Park. It is currently closed for construction at a new location near Stonehenge but will hopefully be open by the time you get here next summer. A few miles east of your “home base,” you can visit historic Fort Vancouver in Vancouver, Washington and tour the famous Pendleton Woolen Mill in nearby Washougal. Also of note, you’ll need a Discover Pass get into our state parks is $35/carload for an annual pass or $11.25/carload per day. Depending on how many you plan to visit, the annual pass may be your best option. Every place I mentioned above has nearby hikes of all levels, wineries and breweries for you to visit. If your timeline is flexible, I think late August or early September would be the best time to visit but anytime after the first of July on should be warm and wonderful. Thanks for your interest in visiting Washington State; enjoy your trip! P.S. If you share photos via Facebook or Instagram, be sure to use #ScenicWA @scenicwa so we can “ride” along with you. Regardless, let us know how it goes. Best Route from Seattle to Portland avoiding the "boring interstate"
We will be travelling south from Seattle to San Francisco in early September. I do not want to drive a boring interstate so on the section down to Portland I am thinking about Seattle to Greenwater down to Grove of the Patriarchs, but then I cannot decide whether to follow 12 east via Rimrock to Yakima and then south on 97 to the Gorge and back to Portland, or to drop down to Randle then south on State Route 131 and FS 25 to Northwoods and south again to Stabler and Carson. I can see that the first option is going to be a serviceable route, but I wondered what the second option would be like as at least two of our party get a little nervous about precipitous drops. We will be in a rented SUV. Any useful insights would be gratefully received. After Portland we are heading over to the coast and following our noses toward California, stopping in Yachats, Brookings and Eureka, so suggestions for any highlights that I should include would also be welcome. Thanks for the inquiry. I share your desire to get off the main roads and really like your itinerary; but would encourage you to take the road past the Grove of the Patriarchs all the way to Paradise at the base of Mount Rainer. It is awe inspiring and the view of it from Reflection Lake off the Stevens Canyon road is nearly as cool. From there, the Stevens Canyon road will take you back down to the Grove of the Patriarchs to intersect with US-12. When you get to Carson, if you have any interest at all in our native culture, you should head east on SR-14 for a few miles to Columbia Hills State Park to see a great display of petroglyphs that were rescued from inundation by the backwaters of the Dalles Dam several years ago. From there, you can cross the Columbia at the Dalles Dam and take I-84 west to Portland. However, if you want to stay off the interstate and continue on the smaller road, backtrack on SR-14 and visit the Columbia River Gorge Interpretive Center in Stevenson (their logo is based on one of the petroglyphs you’ll see at Columbia Hills) then cross the bridge to Portland at Vancouver. There is a great Hudson’s Bay fort at Fort Vancouver if you’re interested in our history… I think it’s great. On this route, you’ll also pass by Beacon Rock—noted in the Lewis & Clark journals as the first place they detected tidal influences and knew they were nearing the Pacific Ocean. Another little town you’ll pass through, Camas, is adorable and would be a nice place to stop for lunch if the timing is right. I don’t have much first-hand knowledge of anything in Oregon or California so you’ll have to find another source for more information on that leg of your journey. Many thanks Randle it is then. Would you recommend coming in from Seattle via Longmire and Paradise rather than the northern route via Greenwater? Yes; I think that would be the best approach to enter the National Park through the Nisqually entrance on WA-706 near Ashford then you can catch Reflection Lake and the Grove of the Patriarchs on the way down via Stevens Canyon road without any backtracking. By the way, Longmire has an interesting history and a fairly short interpretive loop trail that I enjoyed. My husband & I will be traveling with his service dog. Arriving SEA by plane 8/24 & departing 9/4/18. We are renting a car & want to travel some of the most scenic byways avoiding really touristy/crowded areas. Must dos are: the Hoh Rainforest, waterfalls, spectacular beaches (without crowds). We love oysters so definitely would like to sample Washington's freshest as well as some WA vineyards. Looking for route suggestions, lodging & restaurant recommendations. We would prefer not to change lodging every night. Stop 1: From SEA, take a Washington State Ferry from Seattle to Bremerton (you might consider lunch on the Bremerton waterfront with a view of the US Navy mothball fleet) then drive south on WA-3 to connect with WA-106 to Union. Spend your first night at the Alderbrook Resort. It is a beautiful property on the southern tip of Hood Canal and near some of the best oyster shucking the state has to offer at the nearby Hama Hama oyster farm; eat your fill! Stop 2: Drive north on US-101 to spend your second and maybe third night in Port Townsend. It is a delightful Victorian-era seaport filled with shops, restaurants and boutique lodging. I like the Swan Hotel but there are a lot of options available on their website. NOTE: The Olympic Peninsula is filled with waterfall options. Here is a link to the Waterfall Trail to find ones that will be easy to access with the service dog. Here is a link to a pdf of the trail map from the site. Stop 3: From Port Townsend, continue west on US-101 to Port Angeles where you may want to drive up to the top of Hurricane Ridge in Olympic National Park. It's a really beautiful drive with some easy hikes to enjoy the majesty of Mount Olympus. You might want to consider spending the night in Port Angeles for a night or two to explore Hurricane Ridge and some of the nearby waterfalls. It is about 50-miles from Port Angeles to the Hoh Rain Forest and Cape Flattery and the Makah Tribal Museum… all of which I would highly recommend but would make for a long day. Depending on your energy level, you could do day trip out to the coast or find a place to stay near Forks for that part of the journey. We know some nice folks at Olympic Peninsula Vacation Rentals that have a few homes and cabins that would make a great home base to explore the Hoh Rainforest, the uncrowded Pacific Ocean coastline, Cape Flattery and the tribal museum. From here, you can either backtrack to Seattle crossing the Washington State Ferry from Kingston to Edmonds or continue south on US-101 and circle back through Olympia to Seattle. Stop 4: You mentioned WA vineyards but those options are pretty limited in Western Washington… our best “Wine Country” experience is actually east of the Cascade mountain range and might be a bit further than you want to travel on this trip… it’s about a 4-hour drive from Seattle and would require at least 2-3 days to check out. If, however, you’re true interest in WA vineyards is really WA Wine… there is a place you should visit near Seattle. Woodinville has a ton of WA wine tasting rooms and some pretty neat places to stay. You might want to consider staying in nearby Bothell to do some tasting and browsing. A new brewpub/hotel called McMenamin’s Anderson School opened there recently in a historic former school building. It’s pretty cool. If you like antiquing, be sure to visit Country Village near downtown Bothell. If you still have time and energy and want to drive to our best wine country areas, let me know and I’ll give you some help with that. Thanks for the inquiry; I know you’ll have a fabulous time here in the Evergreen State! P.S. If you do social media, be sure to tag #ScenicWA so we can follow along on your journey. P.S.S. If you’d like me to send you a travel guide and Washington State road map, send me your mailing address. In August, my wife and I are going to Anacortes to visit my brother. We will be coming on Interstate 90. We are thinking about taking Highway 2 on the way home. We will be pulling a 30 foot 5th wheel camper. When I am pulling my camper, I have to stop every 3 hours to fill up with diesel. Am I going to have problems following that route? You’ll have absolutely no issues with refueling from Anacortes to Wenatchee; however, the stretch from Waterville to Coulee City and on to Spokane is more sparsely populated but dotted with small farm communities, so diesel for trucks and farm equipment is readily available. I’d suggest topping off whenever you can in this area. NOTE: Just before you get to Coulee City, don’t pass up the opportunity to visit the Dry Falls overlook. This is a remnant of the massive glacial Lake Missoula ice age floods that occurred between 14-16,000 years ago and was the largest waterfall in the history of the world for a fleeting moment in time. It’s a fascinating story of natural history. I personally love this region for it’s stark beauty. Planning a trip to see the "islands"
My wife and I are planning a trip to visit your great area for the first time. We bought a home in Poulsbo so we will eventually be regulars but have been told we must make the trip to see the islands. My question is what would you suggest the best way and route to take. We are planning on arriving on a Friday morning but can also make the trip during the week. We would like to start the adventure from Poulsbo. We are looking at the month of June so please let me know what you recommend. Transportation and hotel accommodations would be helpful. We want to spend 2 nights and see as much as possible. Let me start by saying Poulsbo is a great little town… you’ll enjoy the strong sense of community there. Regarding a visit to the “Islands” I need to clarify a couple of points. The “Drive off the Mainland” campaign you attached is for two islands, Whidbey and Camano that both have plenty of things to see and do. If these are the islands you’re interested in visiting, the best route from Poulsbo would be to cross the Hood Canal Bridge and drive north on US-101 to Port Townsend… a very neat historic Victorian seaport community. (The entire downtown is on the National Historic Registry.) Take the ferry from Port Townsend to Coupeville to reach Whidbey Island. CLICK HERE for a link to their website which includes accommodation and transportation information. The “islands” your friends told you to see could also be the San Juan Islands. From Poulsbo, go to Port Townsend to catch the ferry to Whidbey Island. From there follow WA-20 across the stunning Deception Pass bridge and follow the signs to Anacortes where you can catch a Washington State Ferry to the San Juans. While many of the islands have some tourist appeal, I’d recommend San Juan Island to get the most bang for your short stay buck. CLICK HERE for a link to their website which includes accommodation and transportation information. Let me know if you need any more specific information. Thanks for the inquiry and welcome to Washington! Marcus, this is what I needed. Yes, he did mention the San Juan Islands as well. I want to see it all. So I can take the car on the ferry to both Whidbey, Camano, and San Juan? Man, I can't wait to start our Washington adventure. We are both from the Southside of Chicago and currently in Kansas City Missouri. I am so sick and tired of the mid-west. Again, I really appreciate this information. PS – You are correct. Port Townsend is really a neat town. We won’t be that far form Poulsbo. We will spend many a Saturday afternoon in Port Townsend. In search of the "World's Largest..."
I will be doing a road trip in July. I'll be driving from Vancouver down to Seattle, sleeping in Spokane and then heading to Lewis and Clark Caverns in Montana. Do you have any highway maps or a road trip guide you can mail to me to help in our road trip? I also would like to hit some of the world's largest if possible. I know that Seattle has the world's largest hat n boot at Oxbow park and the Fremont Troll. Are there any other's I should know about? Looking forward to receiving anything you can send to me. A map and guide are on their way. Regarding “World’s Largest” the Boeing Tour is located in the largest building by volume in the world… it’s also the building where they assemble the some of the world’s largest airplanes so you can get two for the price of one and is about 45 minutes north of Seattle. An associate of mine told me that the world’s tallest Totem Pole is in Kalama about two hours south of Seattle. And, in one of our rainforests, about 3 hours west of Seattle on the Olympic Peninsula, you can find the world’s tallest Sitka Spruce. That’s all we came up with. What a fun quest! Dear Readers: If you know of any other "World's Largest" in Washington State, please let me know. We are planning a motorcycle trip along the north & south shores of the Columbia River essentially from Vancouver, Wa to Plymouth....on #84 & 30 going westbound (south of the river) in Oregon and returning via #14 eastbound (on the north side) in Washington. Can I get detailed maps of just this river-ride area + any info/brochures/material on things to see and do?? The Oregon “west Columbia gorge visitor guide” is just one example that might prove helpful. But any leads to a tourism center or info on the “east” portion would also be appreciated. Sounds like a delightful road trip. One of my favorite people in the Washington State tourism industry, Casey Roeder (casey@skamania.org) just happens to be located on this stretch of highway in Stevenson. I have cc’d her on this response so she can follow up with you with maps, great curvy road side trips to a Stonehenge replica, Native American petroglyphs, beautiful waterfalls, volcano views, wineries, sasquatch sightings and pretty much anything else you want to know about that region. She is a great resource and I’m certain will recommend some incredibly cool itinerary ideas for you. Q: We are looking into visiting Washington in November, spending about a week before catching a train to LA. We are interested in touring a bit of Seattle for a couple days, and off to Olympic NP (forest & seashore), any ideas to help us with our itinerary, which route to take (we will be driving), where to stay and what to see during our short adventure. Here is what we have. Tentative Itinerary 1 – We would like to spend a couple of days in Seattle (11/5 – 11/8). What to see and do? Safe hotels to stay? Leave for trip around peninsula (11/8 – 11/13)… We are wanting to see forest & beaches, thinking that the mountains would be too snowy and difficult at that time, what do you think? (but we really don’t know that…coming from Hawai’I and never been in or touched snow…experience only through magazines and television). Maybe staying in 2-3 lodges around the peninsula. What to see and do? Returning to Seattle sometime on the Wednesday, 13th…We would need a hotel close to both the rail and King train station. We would like to check in, return the car to airport, catch rail back to hotel, and leave the next morning on the Amtrak Coast Starlight to LA. Don’t know if we need to catch shuttle or cab or walk to train station. This will be our first experience on rail and train…should be quite interesting. Do we need some type of chain on the tires? Tentative Itinerary 2 – We get in late on 11/5, start our adventure around the peninsula and end up back in Seattle on the 11/10. Spend a couple days in Seattle and leave on morning of 11/14 with the train. My fiance suggested itinerary 2…..I suggested itinerary 1, because I thought the hotel would be more expensive and places more crowded due to the Veteran’s Day holiday when we get back to Seattle. Anyway, like I said anything is of great appreciation! Mahalo! A: I think doing the Peninsula at the beginning makes sense and as long as you book your Seattle hotel in advance, doubt there will be much of a Veterans Day bump but not 100% sure about that. From Seattle, to Victorian Port Townsend Take the Edmonds-Kingston Ferry (about 20 miles north of Seattle) and follow WA-104 to cross the Hood Canal Bridge and connect with US-101 on the Olympic Peninsula. Stop at the little cafe/bakery in Port Gamble just before you cross the bridge. A pretty cute and historic “Company” town from a bygone era of the timber barons. From US-101, take the WA-20 cutoff to Port Townsend. Port Townsend is a seaport village from the 1890s; the entire downtown district is on the National Historic Register. I like the Swan or Bishop hotels there, but there are plenty of options and several good restaurants. I like the Alchemy Bistro and Wine Bar but there are a lot of good choices so ask around. If you’re into history, there is a pre-WWI fort called Fort Worden that is worth a visit; it was part of the “Triangle of Fire” built to protect Puget Sound from foreign invasion. Guns were never fired except for drills but still a great history. Spend the first night there. From Port Townsend, get back out on US-101 and go north to Port Angeles; take the drive up to Hurricane Ridge for a great view of Mount Olympus and you might even get to touch some snow! From Port Angeles, continue west on US-101 and if you’re into a pretty easy hike, stop at Storm King Ranger Station and take the hike to Marymere Falls; it takes a little over an hour round trip through some thick forest and is quite a nice and pretty easy walk until you get to the falls; even then if you want to stand at the base, it’s easy; if you decide to scramble up the trail to the top; a little harder. From Marymere, continue west and take WA-113 north then west again on WA-112. This will take you to the most northwestern point of the lower 48 states at Cape Flattery; again a pretty easy hike to a beautiful point where the Strait of Juan de Fuca meets the Pacific Ocean. From here, you’ll need to backtrack and go south on US-101 to Forks. Find someplace to stay there; it will have already been a long day. I have stayed in a beach cabin at Oceanside Resort on the Quileute Tribal land at LaPush. If you get one of the new cabins, you’re literally sitting right on the beach; I loved it there. Otherwise, there are a lot of less expensive but clean options in Forks. There are some beautiful beach trails near LaPush… ask about First and Second Beach hikes. Sea stack rocks and lots of wildlife… beautiful regardless of the weather. From Forks, drive a bit south to the entrance to the Hoh Rainforest; this is so thick with moss and oxygen that it literally takes your breath away. A very much must do. There are some very short loop trails from the ranger station that will get you some great photo ops. Bring a rain slicker… this time of year it could be wet… by hey… you’re in a rainforest, right? From Ocean Shores, you can go into Aberdeen and take US-12 east and follow the signs to Olympia, our state’s capital city. It’s got a great downtown and lots of good energy. If you guys are into locally brewed beer, go to Fish Tale Ale House. Good food and home crafted beer. I usually stay at the Governor House halfway between the Capital Campus (which is kind of a neat stroll) and the historic downtown district. Not fancy but clean and convenient. From Olympia, it’s about a two hour drive up I-5 back to Seattle. If you or your fiancee are into vintage cars, a must see is the LeMay: America’s car museum in Tacoma. This guy LeMay bought one of every single car ever made in America; added a few foreign jobs and has a selection of them on display at the museum. The rest of his collection is at a place called Marymount but may be overkill unless you’re totally into it. There are a couple hotels right near Safeco and Century Link fields (where the Mariners and Seahawks play) that are very close to King Street Station. Silver Cloud is literally across the street from Safeco but look at anything in or near Pioneer Square. It will probably require a cab or Uber ride depending on how light you pack; but a quick commute to the station. In Seattle, you’ll want to go to Pike Place Market, Pioneer Square, ride the monorail to the Seattle Center, ride to the top of the Space Needle and visit the Museum of Pop Culture (formerly Experience Music Project). It is great. Some local and quickly neighborhoods include Broadway on Capitol Hill; Fremont and Ballard on the north end of town. You can google those neighborhoods… Fremont is one of my favorites but Ballard is growing on me. That’s all I’ve got for now… probably a lot more than you wanted, yes? Let me know if you have any follow up questions and be sure to let us know how it goes. I hope you have a great visit and enjoy our great state as much as I have enjoyed yours! Q. Hi! I have a question about visiting along the U.S./Canadian border. What other locations/or points of are of interest along the international border? I am already planning on visiting the International Peace Arch in Blaine and the international peace park in Glacier National Park, MT. A. While in Blaine, you might want to go over the Resort Semiahmoo for lunch or a drink on the patio; a really nice and relaxing spot. At the crossing near Osoyoos onto US-97, a fun road trip would be to take the road from Oroville to visit the old ghost town of Molson; continue west to Chesaw and Washington’s smallest state park, the grave site of Ranald McDonald (a really fascinating story there) then the Curlew where you can cross back into Canada on WA-21 if you want, or go south to Republic, an old gold mining town with a lot of charm and history. There is a cool fossil dig site there to check out and a dandy brewpub if you’re into that sort of thing. There is a nice loop tour called the International Selkirk Loop hat you might consider for a “two nation vacation” that includes that stretch then crosses back into the US in Idaho. That’s all I’ve got to offer for the Washington portion of your journey. I am in the midst of planning a trip to you for the fall of 2018. I would like some advice on length of stay at certain points. I am looking at 3 days in Seattle; 2-3 days on the Cascade Loop; 4 days in the Olympia Peninsula; 1 day on the Columbia River Gorge; 1 day at Mt. St Helen's; 1 day at Mt. Ranier; 1 day back at Seattle airport & then return home to MI. Does this make sense or do you have other suggestions? A. Yes…. your plan is feasible in terms of timeline but I might make a couple of recommendations. The trip up to Mount St. Helens’ Johnston Ridge Observatory is one way in and one way out; about a full day of driving including stops at the visitor center and observatory at the top. This is a great trip and hanging out in downtown Longview has a lot of benefits. However, if time is an issue, one way to maximize it would be to connect Rainier, St. Helens and the Gorge on a big loop of sorts.If you have a Washington State map, you can trace this plan. From Seattle, head south to Tacoma and catch WA-7 south to Elbe where it intersects with WA-706. Go east on WA-706 to Paradise (the absolute “must” place to stand at the base of Mount Rainier); then follow the road south that takes you past Reflection Lake to Ohanepecosh State Park. (Be sure to stop when you see the signs and take the short hike to see the Grove of the Patriarchs—a stand of massive old growth forest). From Ohanepecosh, go south on WA-103 to US-12 then go west toward Packwood. This might be a good place to spend the night. From Packwood, continue west to Randle and take WA-131 south toward the Windy Ridge Observatory. This is a really excellent view of Mount St. Helens, Spirit Lake and a standing dead forest. From here, continue south on a forest service road (paved, good condition) and follow the signs to Trout Lake, White Salmon and Bingen. Bingen is on the banks of the Columbia so you can turn east or west on WA-14. I’d turn east as far as Maryhill Museum and a replica of Stonehenge and a visit to Maryhill Winery; swing into Columbia Hills State Park to see a bunch of native petroglyphs that were rescued from inundation by the John Day Dam—some can be seen from the parking lot but others require a reservation and guided tour with a park ranger. From there, backtrack to Stevenson to spend the night… check out the Skamania Lodge for lodging. There is a great Columbia Gorge Interpretive Center in Stevenson to visit; a recommended stop. If you take the guided tour, one of the petroglyphs you’ll see at Columbia Hills is the basis for their logo (She Who Watches). I think the hike to the top of Beacon Rock is worth the time (a little over an hour). The trail is a series of switchbacks to the very top; not extremely difficult but it is not super easy either depending on what kind of shape you’re in; the view of the river from the top is stunning. From there, continue west to Vancouver( Fort Vancouver is a pretty neat Hudson’s Bay fur trading post with reenactors who are “stuck in time” and can explain the workings of the fort back in its heyday.) From Vancouver, you can gead north on I-5 back to Seattle or better yet, follow the Lewis & Clark trail through Longview and on to the Pacific Coast at Long Beach to begin your exploration up the Olympic Peninsula. I’m pretty jealous… your itinerary includes a lot of my favorite road trips. Let me know how it goes and if you have any specific questions about any of the other legs, don’t hesitate to ask.